First of all, if when ordering this book, you absolutely need to also buy/borrow Season of Sanematsu, as it is the continuation of this book. If you don't, you're left with a terrible cliffhanger that won't give you satisfaction. It isn't like it's a series. It is basically the last half of the book itself. Imagine starting a book you like, and the last half of the books has all the pages ripped out. This is why you need the second book. Now.. on with the review..
How can I put this in a nice way? The book is great, and held my interest. But it's too bad that I had recently read James Clavell's Shogun which sort of put this book in its shadow. I liken The Seabird of Sanematsu to something that is in the market for kids toys or books, branding as My First Shogun. 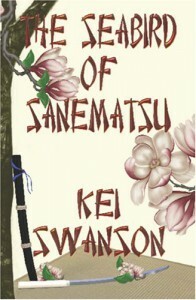 You have all of the glorious descriptions of feudal Japan, and a little bit of violence here and there, but Kei Swanson is no James Clavell. No one is. Had I not read Shogun first I would have been completely consumed. I read this book very quickly and at the same time couldn't put it down, so it really was captivating, and an easier read than Shogun. I love how the two characters are so drawn to each other, but it is the entire basis of the book. I mean, hello?--there's a war going on, and the daimyo and barbarian girl are concerned about "the warmth between her legs"? I did not notice this book is classified as Historical Romance. Romance is the key here. It is as if this book is primarily romance-driven first with touches of drama and action peppered throughout. Though, I didn't mind! If you don't have the time or energy to put your brain to work with Shogun, this book is absolutely perfect! If you've never read Shogun, you'll be amazed at what you'll learn about feudal Japan. If interracial romance intrigues you between Asian and Caucasian, you'll love this. As I said before, this book needed to be ordered from where I live, because it wasn't found in stores, and I am all too relieved I bought the second book just so I can find out what happens! I suggest you do the same if you decide to read this.